How does Copiosis end debt? Credit cards are a blessing while you’re spending. Credit cards are hell when it’s time to pay. The average American family owes over $15,000 on their credit cards. As if that weren’t bad enough, most home owners have a mortgage. Most of us own cars or lease them. Many of us have student loans. That’s still more debt. Wouldn’t it be nice to just have that debt go away? Wouldn’t it be pleasant to contemplate a future in which you didn’t owe anyone any money at all? If you have a crushing amount of debt today, you know that you are stuck. Your reputation is shot. Your chances of taking care of your family are just about nil. You have trouble getting more credit. But at the transition to a Copiosis economy, your debt simply disappears. It’s gone. It doesn’t exist any more. There is no credit and no debt in a Copiosis economy. How can that be? 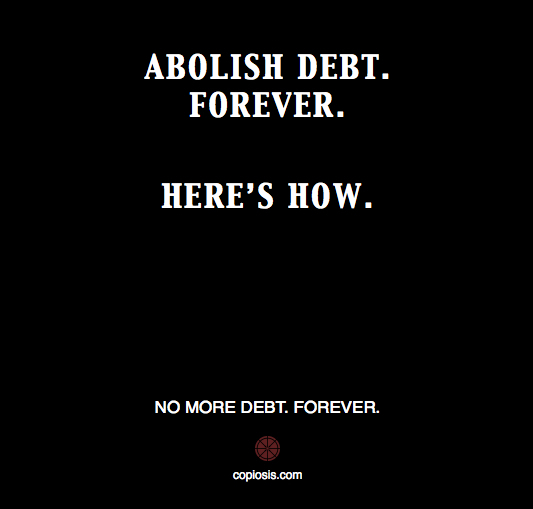 How is it that at the transition to a Copiosis economy one’s debts simply are no more? Money in a Copiosis Economy is not transferable from one person to another nor from one group to another nor from one organization to another. So even if you kept your debt you could not pay it off. There would be no way for you to give any of your money to any other person nor to any organization. Whether your debt is to a friend, to a business, or even to the federal government, it simply cannot be paid. So the debt is no more. If you have a home it cannot be foreclosed. Since in Copiosis there are no taxes of any kind, you cannot lose that home for failure to pay taxes. Your assets are safe. They cannot be taken for failure to pay any debt you may have had on them. Of course this lack of debt also means that you can never borrow money but then you will never need to borrow money in a Copiosis society. Demand determines how much is spent. Simplistically speaking our economy today runs on demand, dollar-backed demand. If people with money enter the market and buy, prices are driven up and that motivates sellers to produce more items for sale. When there is too little demand, prices fall and sellers, lacking motivation, provide fewer items for sale. But that means that if few people have money to spend there is little demand and therefore, little production takes place. In other words, even though there are lots of people who want to work and who are skilled at what they do and even though there are plenty of raw materials to work with and even though people really want the things they can produce, the supply of money, a figment of the human imagination, limits and reduces the amount of goods produced. This is one of the reasons business refused to hire workers during the great recession. Those people with money to spend in our economic system are usually also producers of goods and services. Their supply of money comes from other people spending. But the flow of money to the buyers of goods is not always steady and regular. There are all sorts of irregularities in the supply of money that is available for spending. In a Copiosis economy, the supply of money depends only upon the supply of goods and services designated as Luxuries. If more Luxuries are produced there is more money available to pay for net-benefits. Therefore, from the point of view of the producer, an increase in production will almost always result in an increase in income. This is a relationship between producers of goods and the Payers who credit their accounts. Note that the customer’s buying does not control the supply of money. The money that the customer spends ceases to exist when spent and the supply of Luxuries for sale is reduced by the same amount since the customer now owns that Luxury. Thus there is always money available to buy the existing Luxuries and always Luxuries available to sell for the existing money. The supply of money and things that money can buy is always (for all practical purposes) balance. Money does not exist independently of the supply of goods and services for sale as it does today. Therefore, there is no need for credit or debit to help provide motivation for production. If you produce there will always be money for you to earn. But what about existing debt? The natural question then is, “well this is great, but what about the debt I currently have?”. Your debt is owned by someone. You have it, but the bank, or credit card company who provided you a loan or credit own that debt you have. The value of that debt to them is the interest you pay as the cost of using their money or their credit. This is why the banks or the credit cards do what they do. To create value which looks like and is huge streams of money returning to their pockets in the form of interest payments. In today’s economy, the value these companies create is accounted for in their stock price if they’re a publicly-traded company. If they’re a private company, it is represented usually by a multiple of the value of those money streams. We’re going to ignore private company for now and focus on publicly-traded companies.. The process for eliminating existing debt is basically the same for both types of companies. The stock price represents the value these companies have created in extending you credit or providing you a loan. That value is owned by the stockholders. For example, if a bank is worth $100, and Jane owns 10% of the stock of that company, Jane owns 10 percent of the value of that company. If you have a loan out from that bank, that means, Jane owns a portion of that debt. At the Transition, if Jane and all the other stockholders are paid in cash for the value of their stock ownership, the company and its stockholders are fully compensated for the value your debt represents to them. The balance of your loan goes to zero and the value of your debt is settled with those who own that value-ladened debt. Obviously, this is an enormous process that takes place at the Transition. Most industrial nations currently have the smarts and the resources to identify the details needed to make this process happen. It’s not rocket science. In a post-Transition Copiosis Economy everyone is made whole and you are free of debt.